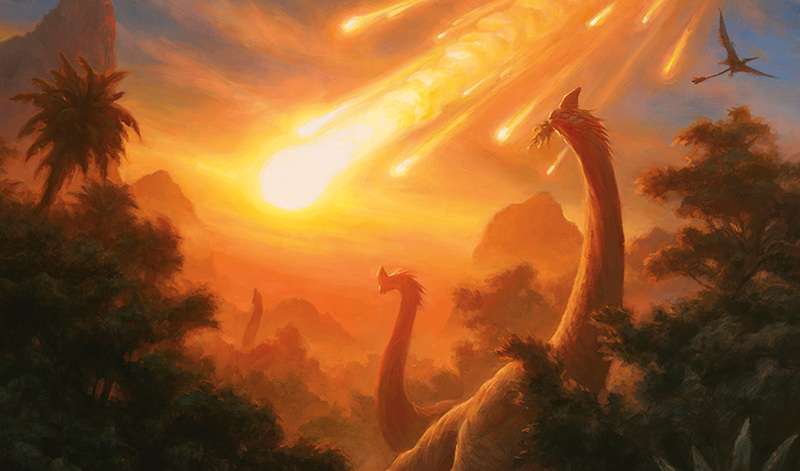 Marshall came back to Magic after discovering Limited and never looked back. He hosts the Limited Resources podcast and does Grand Prix and Pro Tour video commentary. After the rigid world of Trials and tyranny in Amonkhet, I think I'm ready for some fun. And what better way to kick back and relax than to board a Pirate ship heading for a place full of Dinosaurs, Vampires, and Merfolk? Either way, that's where we are heading in Ixalan, and we had better prepare ourselves for it! I've loved dinosaurs since I was a kid. I had a book about dinosaurs, and I used to go through it and memorize all the facts about them—especially my favorite ones—and recite them at dinner to my poor mom who probably couldn't have cared less. It's funny to think about how much of the information I read at the time has already become outdated. For example, in none of the pictures I was shown did any dinosaurs have feathers. 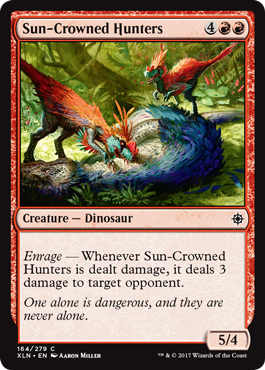 On Ixalan, not only do the Dinosaurs have feathers, but their feathers are sweet. Wow! I know this is a strategy column, and we will be getting into that, but I just have to marvel at the quality of this artwork for a minute. This guy went out doing what he loved: gorging on foliage. Gotta respect that. Oh, there are also Pirates, Vampires, and Merfolk. Pirates are cool I'm told. Maybe I'm just more of a Dinosaur person? Pirates have never really done it for me. Not sure why. Maybe that will change in Ixalan. So the theme of the set is somewhat based on these four tribes, as we've discussed. The cool part is that these themes aren't just expressed in the artwork and flavor text; they are very real strategically as well. We'll start with the Pirates. The first thing you'll note is that Pirates come from three colors, and only three colors. Those colors are what we call the Grixis colors: blue, black, and red. That's interesting to me because it means that we'll either be picking two of these colors together with perhaps a splash into the third, or we'll just be playing all three regularly. What makes this a challenge is that green is not one of the Pirate colors, and therefore mana fixing could be an issue. The good news is that there are plenty of Pirates to go around in these three colors. The real question, of course, is what are these Pirates all about? 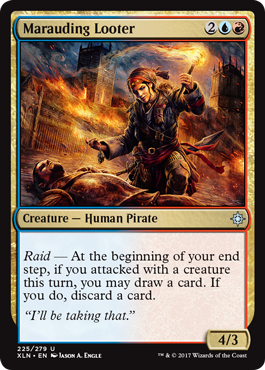 Are they controlling, Grixis-style Pirates who try to scheme their way to a long-game victory? Or are they angry, aggressive Pirates looking to pursue the loot of victory at the earliest convenience? Or maybe we are dealing with magical Pirates who just want to heal the world through spell slinging? Okay, that last one was dumb. My point is we have to figure out how these Pirates are meant to play before we'll know how to draft them. 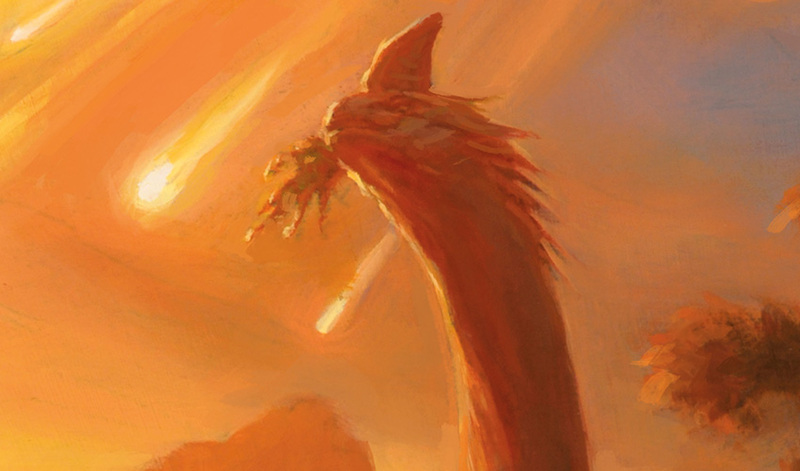 So there are a few obvious answers that turn out to be true in Ixalan. First, Pirates are all about looting. 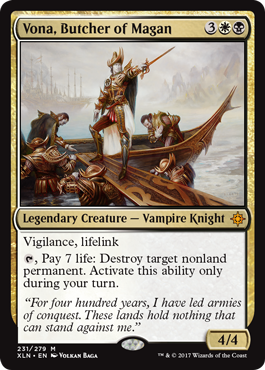 Normally you would think of looting the ships they take over, but in Magic, looting means something different: drawing a card, then discarding a card. The hilarious part? 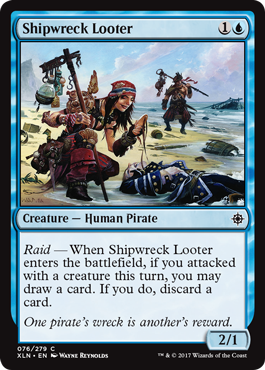 The Pirates on Ixalan actually do that sort of looting! Like, Magic looting! Marauding Looter also leaves a hint as to what else these Pirates want to do. And that is attack. They look pretty aggressive, at least in the sense that they reward aggression through one of their keyword mechanic: raid. You can see that Pirates are looking to battle and will reward you for it. Storm Fleet Spy and Deadeye Tormentor are solid value if you can trigger raid, while Firecannon Blast looks fantastic no matter what. It's a very good removal spell, possibly the best red common as well. Rigging Runner is kind of cool as a one-drop in that it can overperform later in the game but still be played on turn one to enable other raid creatures if needed. With all this raiding and looting going on, you have to wonder what the payoff is for these Pirates, right? Well, it's pretty simple really: Treasure of course. 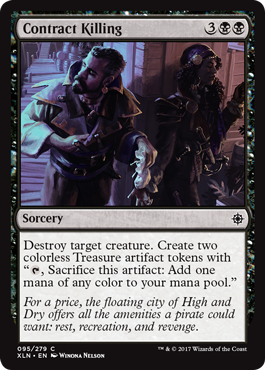 Treasure is something you'll see on a lot of cards in Ixalan, especially Pirates. It's represented by an artifact token that you can tap and sacrifice to make one mana of any color. Prosperous Pirates drops a couple of Treasures onto the battlefield when it shows up, and Contract Killing lets you profit from the death of opposing creatures. Not bad. So what is all of this Treasure for? First thing is that this helps explain how you can play three-color Pirate decks that may be light on color-fixing. A few pieces of Treasure go a long way to splashing some sweet multicolor or off-color Pirates. Also, Ixalan has some other ideas for Treasure, but I'll let you experience those for yourself since they aren't necessarily Pirate-related. So what did we learn about Pirates on Ixalan? They are in red, blue, and black colors. They like looting, raiding, and Treasure. And they look like a fun archetype to play, with a lot of cool twists and turns and directions to go. Dinosaurs, as you might expect, are much more straightforward beasts than Pirates. 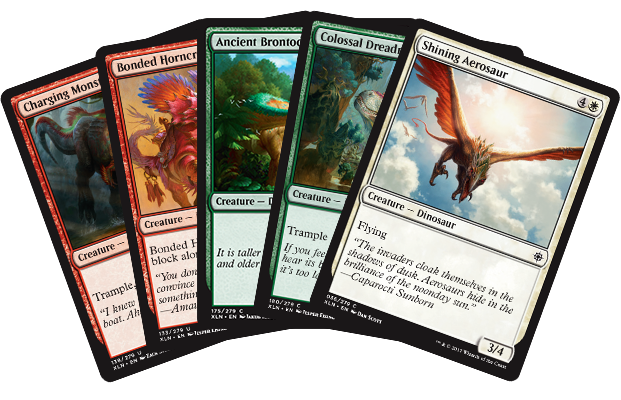 Dinosaurs are in green, white, and red in Ixalan. That makes red kind of interesting, as it's split between Dinosaurs and Pirates. This could make it a hotly contested color, or it could make it the forgotten color as the main Pirates gravitate toward blue and black and the main Dinosaurs end up in white and green. Time will tell there, but what we do know is that Dinosaurs live up to their reputation. What would be the one single word you'd use to describe a Dinosaur to someone?For me, it's "big." And that translates quite nicely to this environment, as many of the Dinosaurs are sporting a lot of power and toughness. As you can see, the traditional thoughts on Dinosaurs are holding quite steady here. These are large creatures with plenty of power and toughness to race against the pesky Pirates any day of the week. They are also quite scary, both in artwork and in gameplay. You feel like you've steadied a board? Hello Charging Monstrosaur! That changes combat math pretty quickly, doesn't it? One thing about Dinosaurs that we don't know, but assume, is that they are ornery. They don't like to be messed with. "You don't poke the bear." 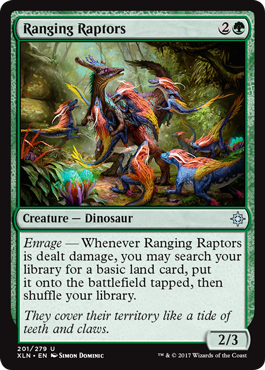 The Dinosaurs of Ixalan take this very seriously, and they get furious at the slightest disturbance. 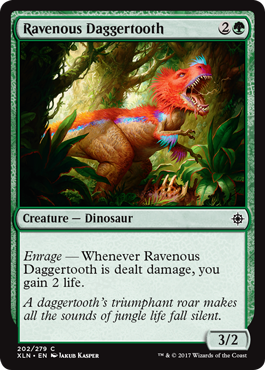 The mechanic here is called enrage, and it triggers whenever the Dinosaur is dealt damage. As you can see, there are many forms of payoff for this mechanic. The tricky part will be triggering it as often as possible. Ideally, it's because your hapless opponent had to chump block your noble and majestic Dinosaur in combat. But there are other ways to get enrage going. A great example is Rile. 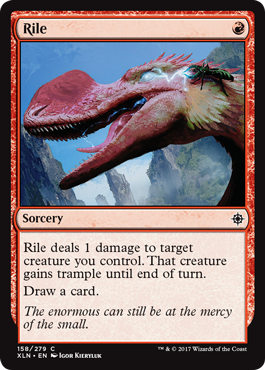 What a simple card, but it can be so effective in a Dinosaur deck because you can use it to poke your own creature and get that bonus while not being down a card (and usually not killing the creature itself). 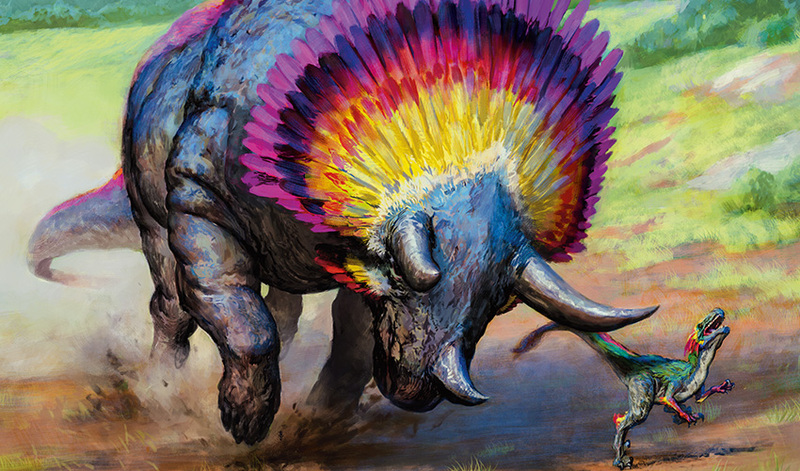 Be ready to inspire your Dinosaurs with cards like Rile if you have enough payoffs in your deck. What did we learn about Dinosaurs? They are big; massive in some cases. They also seem eager to attack and very temperamental at the same time. Harness that energy against your opponent and you could live amongst the Dinosaurs for a long time indeed. Also, they don't seem super interested in Treasure. While the Pirates and Dinosaurs were the two main groups that stuck out to me the most at first viewing, there are two other prominent tribes on Ixalan. Vampires have been in a few colors throughout their Magic history, but this time around they are in a cool pair: black and white. And being both true to Vampires as a creature type as well as being true to the colors they are in, they are all about that gain 'n drain. You can actually get your life total pretty high via combat with these Vampires. Remember, we prefer to not play cards that simply gain us life, but if the life gain comes via lifelink or from incidental sources, we are all for it. And that does seem to be the case here. So what to do with all this extra life? Here we have a few ways to spend all that extra life. 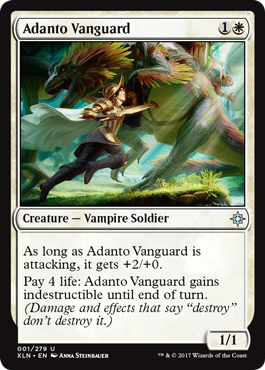 Adanto Vanguard looks very annoying for opposing blockers, and Glorifier of Dusk is a great way to win the late game with that extra life. I normally avoid splashy mythic rares for the purposes of this Limited column, but I just couldn't help myself with Vona, Butcher of Magan. How sweet is that!? 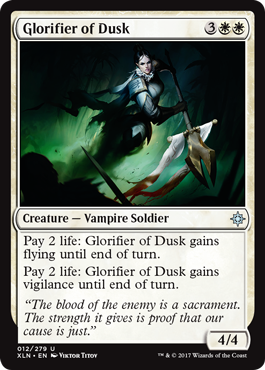 The Vampires in this set also reward what most tribal decks reward: numbers. 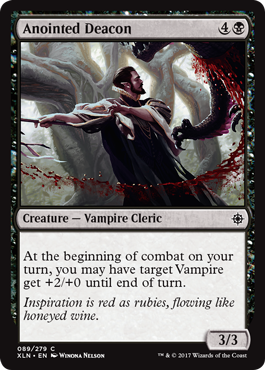 There are numerous cards that "care" about how many Vampires you control, and there are a few ways to make Vampire tokens to bump that number up. 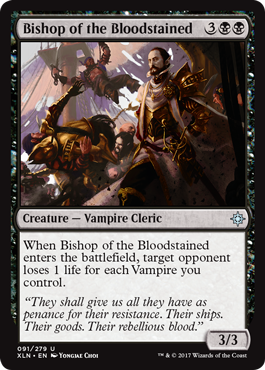 Bishop of the Bloodstained looks like a beautiful curve-topper for a Vampire deck. Sometimes these effects are put on cheaper creatures, but you rarely want this to be anything other than the last Vampire out of your hand anyway. Remember: it does count itself in the case that you have no other Vampires on the battlefield. Anointed Deacon looks pretty strong in a nearly-all-Vampires build. You play it during your first main phase and get the bonus right away (assuming you have a Vampire to attack with). Combine this with lifelink to get the other Vampire synergies rolling quite nicely. 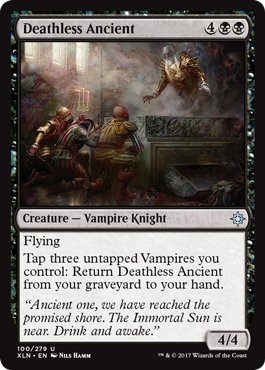 Deathless Ancient is kind of cool, in an attrition-type way. A 4/4 flier for six mana is only okay, but it's really difficult to get rid of in the long game, assuming you have enough Vampires in your deck once again. There's one last tribe to touch on: good old Merfolk. 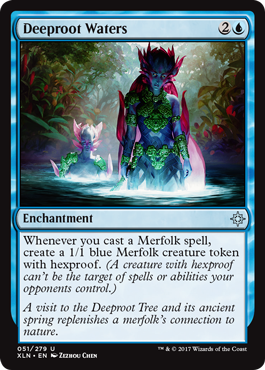 Merfolk have some serious fans out there, and they will be both excited and perhaps a bit shocked to see that they are in one obvious Merfolk color, blue, but also in perhaps the least obvious Merfolk color as well—green. Longtime readers will know that green-blue is my favorite two-color combo, right up there with blue and black. Blue and green work well together here because you can grow your Merfolk via +1/+1 counters and other pump effects, yet also make them difficult to block. Some of them also care about how many Merfolk you have. Again, this is pretty standard for a tribal theme in Limited. 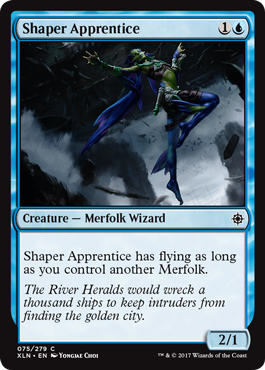 Shaper Apprentice will be a sweet little beatdown creature in a dedicated Merfolk deck, and at least can attack and block even when it doesn't have flying. 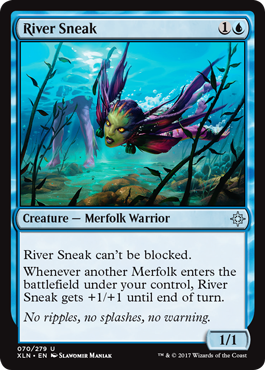 River Sneak is a potentially powerful attacker, but it's pretty embarrassing on blocking duty, so you'll want to be very aggressive and have a ton of Merfolk in your deck before you play a River Sneak or three. 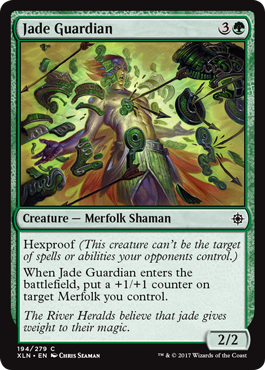 I mentioned growing Merfolk, and Jade Guardian is a good example of just that. It can be a 3/3 hexproof for four mana, or it can distribute that +1/+1 counter to any Merfolk you control, possibly enabling an attack you didn't already have. 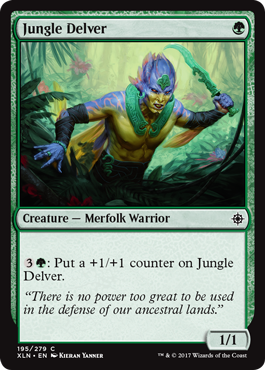 Jungle Delver has that whole +1/+1 counter thing going, but is pretty slow on its own. I would guess you can play it in a fully dedicated Merfolk deck but that it may prove too slow for other decks. 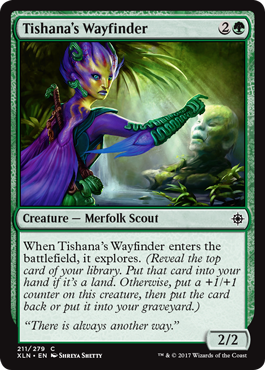 Tishana's Wayfinder is a good example of the new explore mechanic. It's really all upside with cards like this. If you hit a spell, you get a 3/3 for three mana and some control over where that spell goes and whether you'd like to draw it or not. If it's a land, you are basically drawing a card for free. Either way, you are pretty happy. Ixalan has a lot going on. Don't be afraid to try out any of these tribes or any of the other many possibilities early on in the Limited format. Me? I think I'll start with Dinosaurs.